When I was a kid, I knew that the United States interfered in the politics of South America, pursuing a goal to keep those nations democratic and free of Communist influence. Hardly a week went by without some banana republic being invaded by the US in the name of liberty, and I remember my dad viewing Manuel Noriega as some sort of clown. Iran-Contra, Oliver North, General Pinochet, all these names and events filled news headlines when I was growing up, all sanitised and distilled to statistics and politics. I never really had any inkling of the human cost of what was happening in the region, and nor would you expect me to. 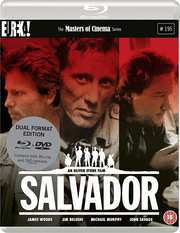 I wouldn’t have been old enough to watch the eighteen-rated Salvador until the nineties. 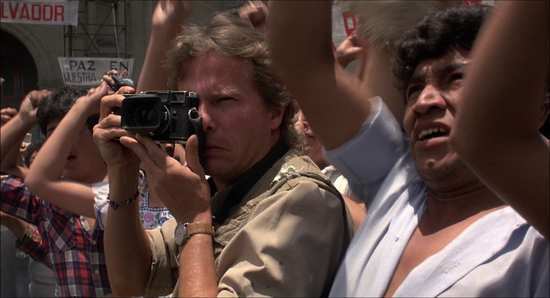 After a few false starts, this was Oliver Stone’s last chance at directing a feature film, and in 1986 he adapted the true story of photo-journalist Richard Boyle to the screen, covering the civil war in El Salvador in 1980-81. Richard Boyle was a hard-up, amoral journalist who was always looking for the next buck-making story. Grabbing his friend, out-of-work DJ Doc. Rock, they headed south to El Salvador, where the next photogenic war was brewing. Having had a blast with the local politicians and prostitutes a few years previously, Boyle was expecting more of the same. Only by 1980, the civil war in El Salvador had turned nasty, with the right wing power in the country, supported by the military, and funded by the US determined to stop Communist insurgency in South America, given a free hand to exercise their power as they willed. That meant a crack down on free speech, that meant intimidation and violence, and that meant the death squads and thousands of government critics being made to ‘disappear’. Grabbing the perfect photo in such strife means money to Richard Boyle, it means notoriety and fame. But his amoral dispassion is challenged when the war becomes personal. 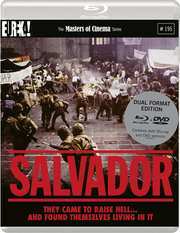 Salvador gets a 1.85:1 widescreen 1080p presentation on this Blu-ray disc. It’s an excellent transfer of a film which has probably seen better days. The image is clear and sharp, there are no visible signs of compression or aliasing, and detail is excellent. But the print, while it is stable does show the odd fleck of dirt, the occasional scratch, and moments of flicker. 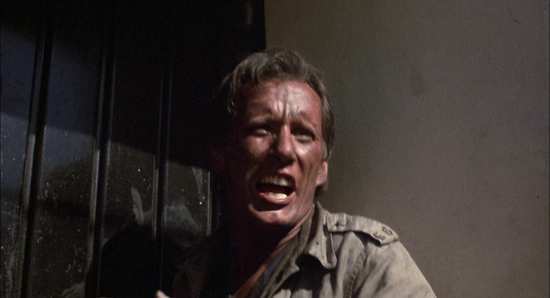 Grain is naturalistic and heavy at times, and it’s clear that the film hasn’t had any significant restoration or processing on its way to its Blu-ray presentation. You have the choice between DTS-HD MA 5.1 Surround and PCM 2.0 Mono English, with optional SDH English subtitles. I have to say that I found the Mono track the way to go here, more naturalistic and authentic, and to my ears anyway, the dialogue was easier to discern from the background noise. Even then, there were a couple of occasions where I was grateful for the subtitle track. The surround option certainly opened out the action without seeming too forced, but the dialogue was a little lower in the mix. There is also a second subtitle stream with the film which translates the Spanish dialogue only during normal playback. Normally this section is filled with vacuous EPK featurettes and contrived extra features, anything to add value to films released on home video. But it turns out that the making of Salvador is just as fascinating a story as the film itself. This being Oliver Stone’s last chance at making a studio feature, he basically did a Bowfinger, blagged, lied, cheated and conned his way into making the movie he wanted to make, and Eureka’s release really does the film proud when it comes to extra features, adding to those that were on the original DVD release. The disc quickly boots to a static menu. 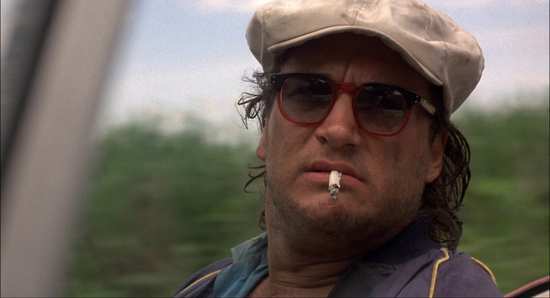 You get an interesting and easy to listen to audio commentary from Oliver Stone. Into the Valley of Death lasts 62:52 (720p upscale) and is the detailed making of documentary with input from the director, the actors, the real Richard Boyle, and the former US Ambassador to El Salvador among others. You get 27:48 of Deleted and Extended Scenes, again presented in 720p. The US Trailer is in HD and runs to 1.59. Added as another audio track alongside the film is the Oliver Stone Audio Interview, recorded in 1986, and which runs to 64 minutes into the film before the film’s audio resumes. Note that in the Q & A session towards the end of the interview, the audience questions are mostly inaudible. Oliver Stone at the BFI is another interview that was conducted in 1994, again presented in 720p and which runs to 42:13. I haven’t seen the usual Eureka booklet that comes with the first run release of their MoC titles to comment. 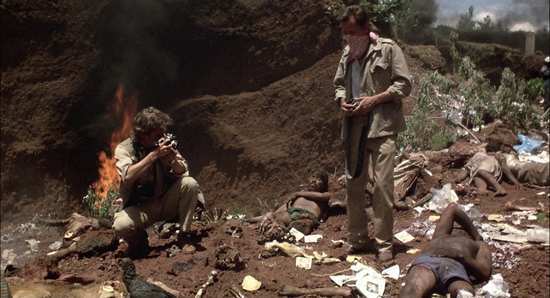 Back in 1986, a budget of $5 million got you one of the most harrowing war movies I’ve seen. Salvador is brutal and unforgiving in its portrayal of violence and conflict, and it’s even harsher in its political commentary. Those sanitised and friendly news reports that I used to see as a child have now had the reality coloured in by Oliver Stone’s movie, the true cost in human lives made clear. Remember that this was before the Internet, mobile phones and live-streaming made the brutality of conflict commonplace in our 24-hour news cycle. The current playground of ideologies, Russia versus the US in Syria doesn’t have a news filter over it, and the only thing left to blame for its continuation is our own compassion fatigue. 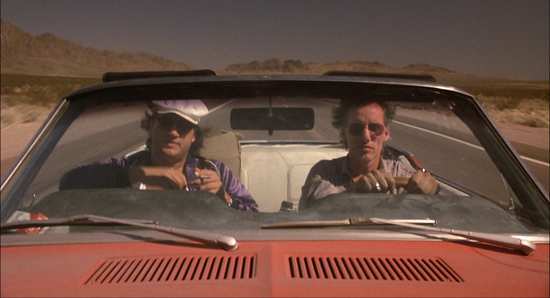 Richard Boyle and Doc Rock, played by James Woods and Jim Belushi respectively almost begin as a comic pairing, as they begin their road trip to South America leaving domestic strife in their wake. 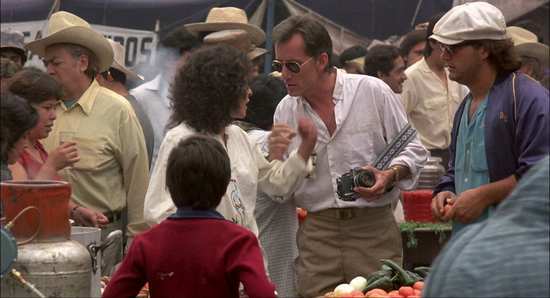 Boyle tempts Doc with the promise of paying off his debt (he had to be bailed out first), as well as the pleasures of the flesh that await them in the Latin American paradise. 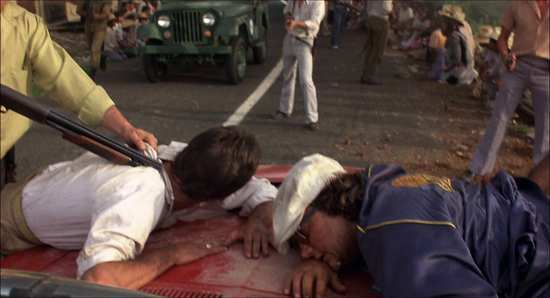 That brief sense of fun vanishes the minute they cross the border to be confronted by a military road-block, an overturned vehicle, and a smouldering corpse. 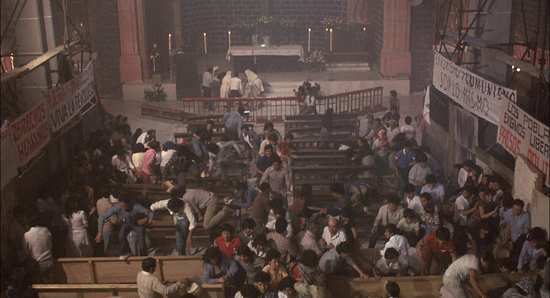 Thereafter, what sense of humour remains to the film is either dark, or counterpoints the tragedy, although it continues to come from the characters of Boyle and Doc, or the absurdity of the US position in El Salvador. It’s all about the money, the job for Boyle, getting the perfect shot of the war, getting that image in print, and he approaches it with a mercenary attitude, taking neither the positions of the government or the rebels seriously. 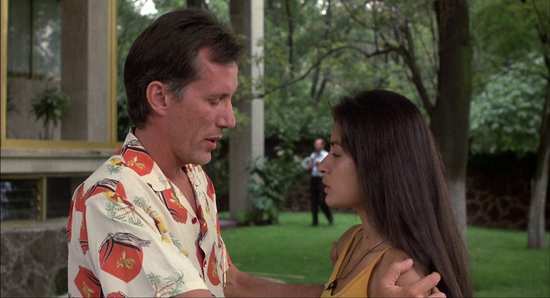 That changes when he runs into an old flame, Maria, and starts seeing the situation from her perspective, as a citizen of the country, or at least she would be a citizen if she had the right papers. The reality of the war becomes clear when Maria’s kid brother becomes one of the disappeared. 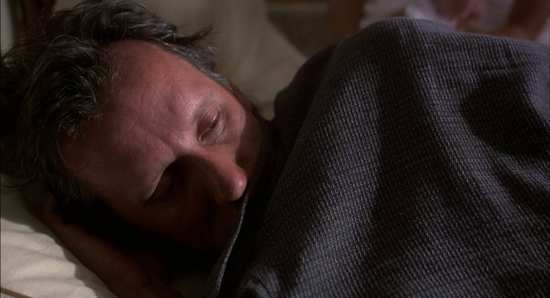 Salvador is a harrowing and uncompromising film to watch. That’s before you remember that it’s actually a true story, which makes certain scenes even harder to take in. I also found plenty to learn in the film, such as the fact that US interventionism in South America wasn’t a Reagan era thing. The El Salvador situation happened under Jimmy Carter’s watch. But there was one significant problem with the film that I found. There are moments where the characters fade, and it feels as if the director’s voice drowns them out. One scene where Boyle lectures a couple of U.S. officials is a case in point, which doesn’t feel true to the character. This is a film that really should be seen. Since El Salvador, US intervention overseas has continued, both militarily and politically. We remember names like Iraq, Syria, Afghanistan, and Libya, Grenada, Cuba, Guatemala and Nicaragua, and there are twenty times as many nations that we don’t recall, but see on our nightly news. Films like Salvador remind us of the human consequences of interventionism.